WHERE: College Street, on the way to the lawn in front of Queen’s Park. WHEN: Between 3 and 3:15 p.m. on Saturday, February 5. 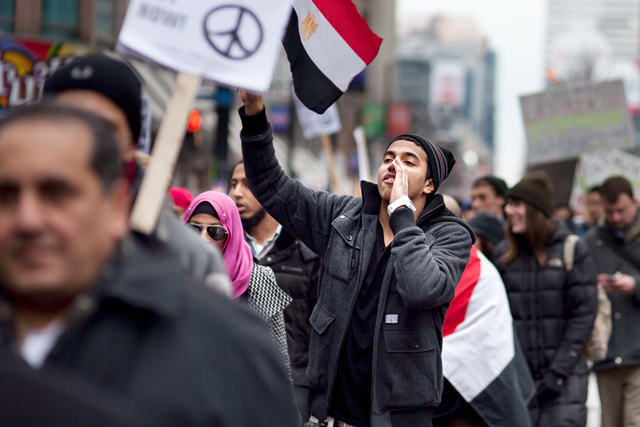 WHAT: For the second Saturday in a row, concerned Torontonians gathered to rally in support of freedom protesters in Egypt. A group of several hundred people gathered this afternoon at Queen’s Park to voice their outrage with the Mubarak regime in Egypt. The rally began with a series of chants in English and Arabic, including, “1, 2, 3, 4, get Mubarak out the door!” and the outdated, but well-rhymed, “Condoleezza, Condoleezza, get Mubarak out of Giza.” The rally continued with speeches and ended with a march down College, Yonge, and Wellesley streets. Compared to last week’s gathering at Yonge-Dundas Square, today’s rally was decidedly more staid. 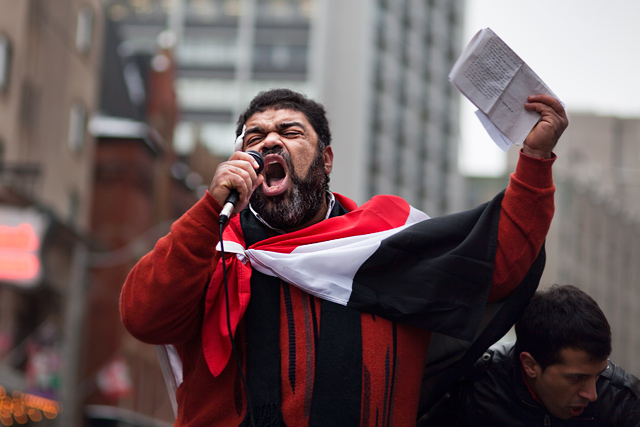 It was also more political; organizers chose to focus on Prime Minister Harper, urging him to take a hard stance against the Mubarak regime. As one speaker noted, Canada may be reluctant to do so because of Mubarak’s role as a “superstar” in the war on terror. Speakers also urged the dismantling of the regime, in addition to the ouster of Mubarak. In light of Mubarak’s plans to stay behind the scenes, the rally’s speakers called for a complete overhaul of Egyptian politics: free elections, the end of emergency law, and the end of government corruption.